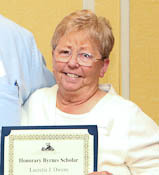 Honorary Byrnes Scholars are persons who have made special contributions to The Byrnes Foundation and who have been duly elected as Honorary Members by the Board of Directors of The Byrnes Scholars. Membership is extended only to those persons whose contribution has been accepted and acknowledged by The Byrnes Foundation. 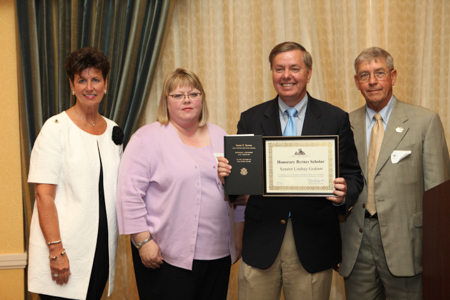 The Honorable Linsday O. Graham, United States Senator from South Carolina, was named an honorary Byrnes Scholar at the 2009 luncheon. Pictured left to right, Foundation Director Paula Harper-Bethea, Scholars President Natalie Owens, Sen. Graham, and Foundation President Dr. Bill Rowe. Aïda Rogers – former editor of the Sandlapper, loyal supporter of the foundation. Lucretia “Miss Lucy” Owens – mother of 1986 scholar Natalie Owens, loyal member of our family for over 25 years. Dennis McElveen – husband of 1984 scholar Pam McElveen, and long-time supporter. Kenya D. White – current Executive Secretary to the Byrnes Foundation.